Tell us about one of the toughest situations you’ve found yourself in as a business owner. The toughest thing for me was finding money to develop the technology. That was extremely hard. It took a long, long time – it took me almost two years to get that done. And because the technology was complex it was very expensive. The way we overcame that, and the strategy we implemented, was partnerships. Because to develop a technology you need grants mostly, you can’t get a loan to develop a technology because it’s a long-term investment – there’s no quick return. If you get a loan, they want their money immediately. If you get a equity investor, it’s a little bit more complex, because most investors now don’t want to invest in research and development. They want to invest in an existing company that already has revenue. So, the only things we had left were grants and competitions. So those are the two strategies we did. For competitions, we applied and we won, so far, 10 international competitions. The second strategy was finding grants. Unfortunately, in Africa there are no grants. And what I mean by no grants, there are no grants that are financed by African governments. One-hundred percent of all the grants that exist on the continent are funded by European or American governments or enterprises, or companies. So, unfortunately, those organisations don’t give directly to African entrepreneurs. So we had to partner with European organisations and NGOs, to channel some of that funding for our research and development. So those are the two key strategies we were able to implement to solve that problem. The moment I’m most proud of, the most recent moment, I would say is our expansion. We opened up in Uganda in May. So now we are considered more of a regional company rather than a small start-up. So taking that leap of faith, that initiative was a big decision, especially for a small company because expansion means more spending, more stress, more of everything – which is not necessarily all good. So that was my proudest moment, when we opened up in Uganda and set up shop, and started working there. Tell us about your greatest weakness as an entrepreneur. I’ve got no patience. I’ve got no patience for nonsense, I’ve got no patience for waiting for things to happen. But, I have no choice, I have to grow some type of patience. I mean, there’s a lot of things as entrepreneurs, or just in life in general, you can’t control. Like we develop a technology and a lot of the issues we had along the way I could not control. So, I had no choice but to wait or quit – quitting was not an option so I had to wait, and be patient. Entrepreneurship will force you to improve on your weaknesses, or you’re going to fail. Which popular entrepreneurial advice do you disagree with? That you need an MBA to be in business, to be a successful entrepreneur. I totally disagree with that. 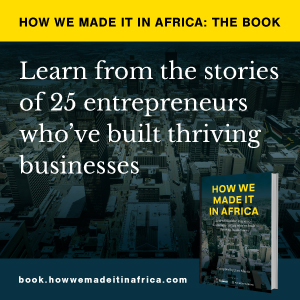 You don’t need to have an MBA, especially in Africa. Because any educational programme for business tries to box you in to specific ways to do business. But in Africa, it is such a fragmented market, it’s such a volatile situation. Because everything is different – you have to be very adaptable, you have to learn quick. You just don’t need to have an MBA to be successful in business. Definitely not in Africa. Is there anything you wish you knew about entrepreneurship before you got started? You definitely have to have a long-term vision to be successful. I used to think entrepreneurship was a quick way to be successful. Second thing I would say, is I used to link entrepreneurship with money – where successful entrepreneurs are the ones making millions, or billions of dollars. One thing I’ve learned as I got older was that you are a successful entrepreneur if you live off your business. If you can pay your day-to-day life, pay your bills, pay your children’s school fees – you are a successful entrepreneur. You don’t need to make millions to be a success. Name a business opportunity you would still like to pursue. I am actually now going into sustainable, green housing. I believe that’s the next biggest opportunity after agriculture. Because as the world is growing, the population will be doubling in Africa. The way we are building homes is just not sustainable and cannot continue. So that’s definitely an opportunity I’m planning to develop. Actually, I just bought some land last week to build a first prototype of a green house. So my personal home, will be a green house as a testing ground, and a learning curve. And I want to do it as an open source. Because, I also believe that we need to stop or minimise all these patented technologies. If we want to scale-up and really help the world, we need to have an open-source approach.